I have a love/hate relationship with this time of year. I love fall. I can’t wait to dive into apple season. I can’t wait to start planning my Halloween costume. I can’t wait to change all my decorations into pumpkins and leaves. But, the weather would have you believe it’s still mid-summer. So all of those perfectly fall desserts that I’ve been drooling over don’t seem appropriate yet. This pie is ridiculously easy. 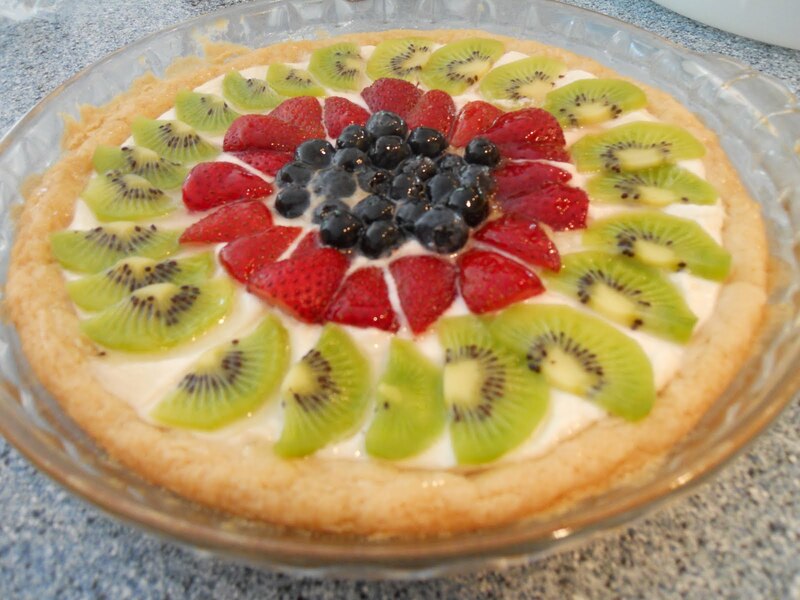 It’s your standard fruit pizza, made into a pie (because, really, who eats it like pizza anyway? I always end up busting out a fork). You can use any in-season fruit for this. I chose the very last of the summer berries. Grease a pie pan very well and then press sugar cookie dough in as evenly as possible to create a crust. Bake for about 30 minutes or until golden brown and cooked through. Let cool completely. Beat together cream cheese, sugar and vanilla. Spread over cookie crust. Top with fruit. Stir jelly until smooth. Brush over fruit.